The Federal Open Market Committee (FOMC) is expected to deliver an anticipated rate hike against a backdrop of firmer growth, reflation, and anticipated fiscal policy change. The December 13-14 meeting will be accompanied by forecast changes and a press conference by the Chair. 2016 is set to close in much better form than it began. The start of the year saw growth stall and investor anxiety surge; but starting around mid-year, these trends reversed course. As the year is set to close, optimism is much improved. 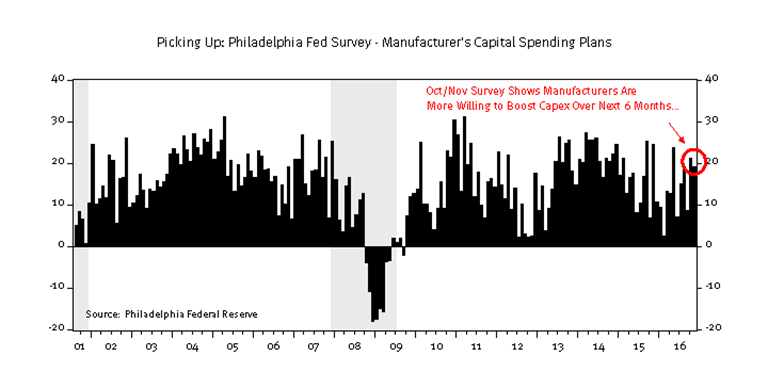 Consumer confidence is strong, analysts are raising profit forecasts, market performance suggest investors are more risk-seeking and less risk-averse, and manufacturers expect to boost investment over the next six months (chart, below). This week’s National Federation of Independent Business (NFIB) survey of small businesses will likely suggest smaller businesses are feeling better about the outlook too. Anticipated policy changes are now feeding into an already improving market and macroeconomic backdrop. Previously, we discussed changes to our forecast, which now sees a bump in growth in 2017-2018 as fiscal stimulus, tax reform, and regulatory reform likely boosts growth. We anticipate the full impact of fiscal changes to more fully impact 2018’s results than 2017, given the time required to make such changes. Fiscal ease should fold into 2018 forecasts, as trade and immigration issues move toward center stage. These issues are potentially the most problematic for growth, but the timing and scope of the proposals are more difficult to handicap than the domestic fiscal plan. Consequently, we are putting less weight on these issues for now. The stock market’s 8% advance and the backing up of interest rates properly reflects an anticipated pickup in both growth and inflation. At this point, the moves do not jeopardize the growth outlook. The Federal Reserve (Fed) will undoubtedly recognize rising long-term rates, higher inflation breakevens, and rising policy rate expectations as consistent with the improved outlook. However, continued upward pressure at the long-end of the Treasury curve, further increases in inflation expectations, and an acceleration of anticipated policy rate increases could impose a near-term cost. A significant further rise in these rates, coupled with a significant further strengthening of the dollar, represents a risk scenario that could upend the markets’ recent rally and throw a wet blanket on the recent rally in risk assets. We will watch to see how the rate paths unfold, ever mindful of the potential risks a significant further rise could impart to the outlook. Until then, we choose to focus more on the positive message contained in the improved growth, profit, and inflation outlook. We expect the Fed to adopt a similar perspective when they deliver their final rate decision of 2016 to the markets this week.